Auburn Hills, Mich., Jan 06, 2004 - What could be better than the Jeep® Wrangler? More Wrangler. The Jeep Wrangler is now available in two distinct configurations – original Wrangler and the new longer Jeep Wrangler Unlimited, adding another page to the heritage of the Jeep brand. The first time Jeep offered both shorter and longer wheelbase versions of the Jeep Universals was 1956 with the introduction of the CJ6. The new 2004½ Jeep Wrangler Unlimited delivers 13 inches more cargo space and two inches more second row seating space for more passenger comfort. The versatility and functionality is increased with the 15-inch longer Jeep Wrangler Unlimited, which now has double the cargo capacity as the original Wrangler. The legend grows. “It has been more than two decades since we offered customers a choice in their wheelbase size with the CJ5 and CJ7 Universals,” said Jeff Bell, Vice President - Chrysler/Jeep Marketing, Chrysler Group. “We’re always listening to our customers by building on the Jeep heritage and giving them truly innovative products that others could never match." The introduction of the Jeep Wrangler Unlimited will broaden the Wrangler target customer to include those who need more space and versatility. 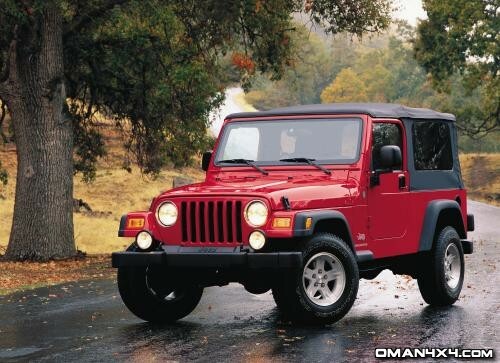 The Jeep Wrangler continues as the only open-air sport-utility vehicle with legendary Jeep 4x4 capability. In addition to the new longer wheelbase the Jeep Wrangler is available as a standard wheelbase with five models in the line-up: SE, X, Sport, Rubicon and Sahara models. “Wrangler stands out as a specialty vehicle that is uniquely classified to provide the incredible outdoor experience and excitement of driving with the top down, doors off and, if desired, the windshield down on the trails,” said Bell. The Jeep Wrangler and Jeep Wrangler Unlimited are built at DaimlerChrysler’s Toledo (Ohio) Stickney Avenue assembly plant. The Jeep Wrangler Unlimited will be sold in North American markets only. If you like the Jeep Wrangler Unlimited get in contact with your local distributor and put pressure on them to bring it to the Middle East!